A positive outlook is absolutely essential for young kids, according to child protection advocate and grieving father Bruce Morcombe. 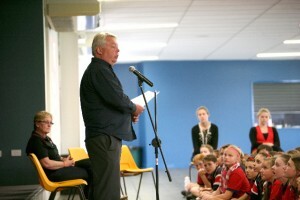 Mr Morcombe was speaking to pupils in Mackay yesterday. He and his wife Denise spoke of the need for kids not to feel weighed down by such events as the tragic abduction and murder of their son Daniel. “[It’s about] not painting the world as a dark place,” Mr Morcombe said. The Morcombes stopped off at St Francis Xavier’s Primary School as part of their campaign to market the Daniel Morcombe Foundation ito raise awareness of child safety and protection. Other schools and parents from the area came to listen as the Morcombes explained the importance of having a healthy respect for technology, and to always trust your instincts in threatening situations. Mr Morcombe advocated use of a specific hand signal, to be used not only in situations where children feel threatened by a predator, but in any scenario where they felt unsafe. He said there were also plans for a new phone app for parents to track their children via GPS. The app would also notify them whenever a child is in trouble. “We’re exploring the possibility of a phone app, that lists emergency numbers [and] brings up a location of where you are,” he said. When asked by a student if children should own a mobile phone, Mr Morcombe was positive. “Mobile phones have really great potential here,” he said. The trip comes in the wake of the recent finding of remains confirmed to be those of Daniel. Mr Morcombe said although the recent events had impacted on them greatly, they were not an impetus for the tour. “This tour has nothing to do with the latest details of the case,” he said. “This was planned back in May,” he said. For more info, see the Daily Mercury.